I met Alyssa MacLeod last May at the CP Canada Network meeting in Halifax, NS. At that time, Alyssa was Miss Nova Scotia Canada, and we were excited to meet with her and talk about her being our World CP Day Ambassador. 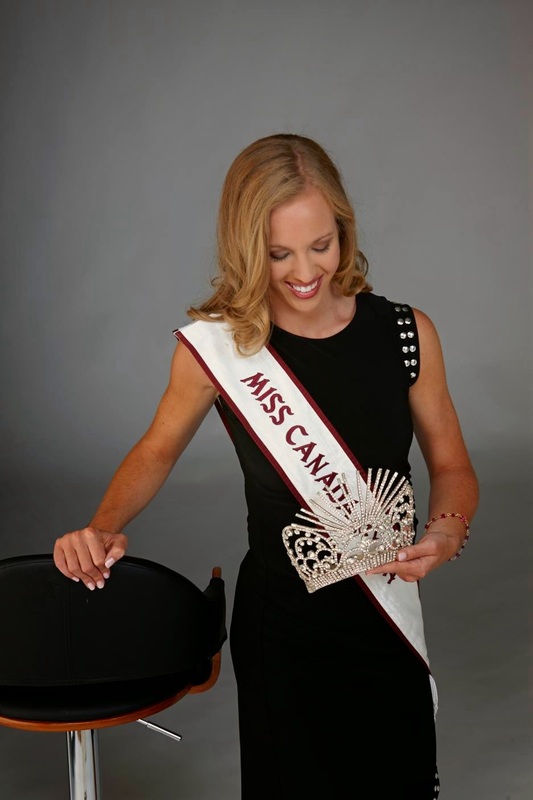 Shortly after the conference, (like literally just a few days later), Alyssa was crowned Miss Canada International 2014! Since then, Alyssa has been busy traveling the country, visiting towns and cities and promoting her personal platform, "The Power of Perseverance". Her year-long reign will take her to communities all across Canada, inspiring youth and people with disabilities. I was born with a mild case of Cerebral Palsy (a term used to describe damage to the motor areas of the brain that can cause difficulties in gaining balance for walking and difficulties in education). As a result, I have had a number of surgeries at the Shriners Hospital for Children in Montreal, where I was a patient from the age of 2-21. In May 2013, I was named the Shriners Hospital for Children Atlantic Canada Ambassador. As Ambassador I have gained significant experience giving speeches and media interviews on my experience as a patient, surgeries I have had as well as the work SHC-Canada does. My Parents and younger sister, (Cally) have been an incredible support throughout my life and medical obstacles, always encouraging me to not let my disability get in the way of being successful and becoming the best person I can be. The obstacles I have had to overcome have taught me a lot about focus and determination. I am absolutely determined to become a doctor and join the incredible team at Shriner’s Hospital for Children-Canada. I am excited to write that I was recently accepted into Medical School, the first step in realizing my dream. The Power of Perseverance - Encouraging Children with Disabilities to Reach their Dreams. I am honored to have been chosen as “Miss Canada International 2014”. As a young woman with a disability, I believe it is important for these young woman as well as the public to realize that people with disabilities have the same feelings and goals as everyone else. They should not be treated differently or feel ashamed of themselves. They have the same rights and should be given the same opportunities as others, regardless of the nature of their disability. They are an asset to the community and can contribute as much as anyone else. They should value and be proud of their uniqueness. As “Miss Canada International”, it is my goal to bring awareness to this unique group of individuals and show that they can be very proud of who they are. As someone who has a disability and someone who has witnessed the way society reacts towards these individuals, I will strive to bring a better understanding to what having a disability means and close the gap society has created. Having a disability means you may need to find alternative ways of doing things, an activity may take you longer than others but that does not mean it is impossible. As a former patient and Ambassador of Shriners Hospital for Children in Montreal, I have been faced with obstacles and surgeries. I have been told that I could not be successful in my endeavors. On numerous occasions people have told me that I could not do something. I took this as a challenge to prove that I can do whatever I set my mind to. I turned the “I can'ts into “I cans”. There is Power in Perseverance. People with disabilities do not give up easily. They must work harder to prove they can accomplish something. It is my intent to show, to encourage and to be an example that people with disabilities can accomplish their goals and be successful in life. Disabilities are very often looked at as a hindrance, but I am an example that if you accept your disability with a positive mindset, you can reach any goal you strive for. A disability is only a disability if you let it become one. I am proud of our Country of Canada and to be an advocate for those with disabilities. A disability doesn’t define you, you define a disability. She has been to five different provinces in the past two months, and is heading for the United States next week. Alyssa, you are an exceptional young lady, and an inspiration to all who meet you, myself included!